Intel Israel’s web site is a vibrant, content rich and constantly changing place. The site reflects Intel’s view that the company is a part of the community and should show its commitment to it. The site provides information about computers and computing in ways that help its readers to understand the technology better and to be able to decide on the best solution for their needs. It presents various issues, for various target readers: latest products and technologies, home computing, future plans, career opportunities, education and more. A team was set up to build the site and to make sure it will remain exciting, interesting and updated for its visitors. During the five years I was the site’s creative director, active member of the concept team and head of interactive programs, we tried to come up with innovative and exciting methods and means that would help people and technology to get closer. Intel Israel’s web activities had a unique agenda: Promoting technology education. Ever since the personal computer was invented in the late 1970s, there have been concerns about inequities in access to this new technology, while increasingly; technological fluency has become a prerequisite for getting jobs and participating meaningfully in our society. This is a problem that Israel, as an immigration country, which is socially, culturally, economically and technologically diverse, has to face. Trying to contribute their share to solving the digital divide problem, Intel has set up and funded three “Computer Club-houses”, an afternoon activity for inner city children, which its goal was to enable participants to learn to express themselves fluently with new technology. Each group was approached separately and has a dedicated section in the site. Our aim with the children’s site was to educate them (Yeda means Knowledge) about technology and its uses and benefits, by turning it into a source for fun and interest – A notion we wanted the children to preserve when growing up, and hopefully become active participants in the technology arena (And not intimidated consumers). We designed the activities to fit both work in the classroom and in their homes. The way to approach children was by creating a stimulating and fun environment, when the educational content is interwoven with games and activities that make the experience enjoyable and worth repeating. We looked at the site as a new and improved sand box, where children develop their skills, while busy playing.We filled the site with versified content: Contests, Trivia games, technological oriented mini sites and more. We were competing on the children’s attention against TV, friends and other computer games. We knew we had to come up with really good ideas if we want to win. The activities on the children’s site were backed up by an education portal dedicated for educators’ needs. We knew that not all educators are proficient technologists, and that some of them may even be intimidated by it. We had to find the way to reach the educators in order to get to the children. We wanted to enrich the educators in technology related issues, and to supply them with project ideas and methods for working on those projects with the children, in the classroom. We wanted the educators to have tools to expand their understanding of technology and the possibilities it holds for education. Many educators connect from home, with low bandwidth modems, so the site has to be as quick to download as possible. The site was built as a newspaper and contained articles that explained technological terms in plain language, essays that dealt with education and technology issues, Class curriculums for different projects and activities, teaching aids and more. Simplicity, friendliness and familiarity were the key concepts for the site. To make the site accessible to wide range of users it had to be easy to use and navigate, the information had to be displayed in a clear, appealing manner and visual queues were widely used. The main information area, which is a dynamically changing content area-the newspaper’s front page. It contains Intel’s “innovation in education” vision statement, links to recent projects and articles and highlighted topics of interest. Use simple, non-buzz wordy language. Explain everything. The articles presented here demonstrate the intentional simplicity of the design. Other topics discussed in articles: computer usage in class, how to build a web site (from goals definitions to hosting and promotion) and more. This interactive product contains a comprehensive guide to a century of computing – “From the slide rule to Pentium 4”. This product presents computing related artifacts which influenced the field for the past century. Objects like slide rule, diskettes or the Galena Crystal Detector- semiconductor first application. The exhibits are divided to five main topics: calculation, processing, memory, storage and silicon, and displayed in chronological order. Each topic starts with an introduction and then enables further exploration by browsing through the last century’s great inventions and innovations, and presents visual and textual information about each exhibit. We enabled downloads of this product for use as a teaching aid in the classroom or as an exciting fact book for curious souls. The Product was translated to English and displayed in Intel.com’s main web site. This is an interactive module we developed as a supplement to the “Century of computing”. It enabled a comparison between global and Israeli technological developments, in the past 30 years. As a local web site, and because Israel is the only R&D center Intel has outside the US, it was important for us to show that many of the significant developments were done here (and by this imply to the kids that they have the power to invent and innovate if they want to). We designed separate arenas in which the user can compare developments in a specified time range. To make the comparison, the user first chooses a date and then can view the technological developments in the world on the screen’s left side, and the developments which occurred in Israel on the right side. The user can navigate between the different inventions in a certain era by clicking on the exhibit buttons. 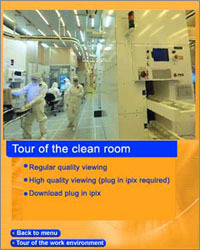 The clean room is the place where computer processors are being manufactured. Almost no one is allowed to enter and watch this process, which is Intel’s core activity. This sterile environment with its futuristic Sci-Fi look (white illumination, robots on the ceiling and on the manufacturing floor, people wearing special “bunny suits”, constant hum of the air filtering system) was about to be exposed to the public eye. Being a success, Intel.com has chosen to display this project in its main web site. We wanted to show people what this place looks like, unveil some of the mystery which surrounds it, make them curious about it, and connect it to their world. We went to Intel’s “Kiryat-Gat” Factory and prepared a virtual tour in the “Clean room” (using Quick Time VR technology). We presented hi definition panoramic view of the insides of the production zone. The user could zoom in and out and turn the image 360 degrees, explore the clean room and obtain some understanding as to how things work. This was never done before. To create an entertaining gaming experience we used strong colors, cartoon like styling, motion and humor. We kept interaction method simple – to adjust to children’s abilities. Our users faced “Teli”, the brainy humoristic talk show host for three rounds on the ring of knowledge. Questions regarding the evolution of technology and computers were presented and our users had to come up with the right answerer’s or to face “Teli’s” witty tongue. We collected all the quiz results and held a raffle amongst the smartest users. The Odessey project is a huge repository of examples for ways to use technology in the classroom. Project samples were collected from all over the world and brought together in an indexed form, in order to serve as a source of inspiration for educators worldwide, as how to use technology in their classroom in creative ways. The Odyssey’s mini site included an Indexed archive and educators’ stories and testimonials regarding the success of these kind of projects. Educators were also encouraged to contribute new projects and ideas to the Odyssey archive. As a promotional activity for the “Innovation in education” site we created this presentation which was displayed in educational conferences and sent to key individuals. It presented the site’s highlights and served as a teaser for educators to visit the site. Viewing the presentation demanded the viewers to wear special glasses, which gave a stunning 3D effect that emphasized the concept that Intel has a different and advanced view regarding educational issues. The viewers could link directly to the site from the presentation. Next PostNext Do you have an opinion?